Thank you to all of our 2018 Sponsors and Advertisers! We are looking forward to welcoming many new sponsors in 2019! Sponsorship demonstrates a willingness to help promote an extraordinary event that is thriving well into its second century. Please contact Sponsorship@devonhorseshow.org or call 610-964-0550 x 219 for additional information on 2019 sponsorships available. Sponsors are asked to supply their own script for the Public Address Announcements and many have an individual to represent their organization when it comes time to present the class ribbons or a Trophy. 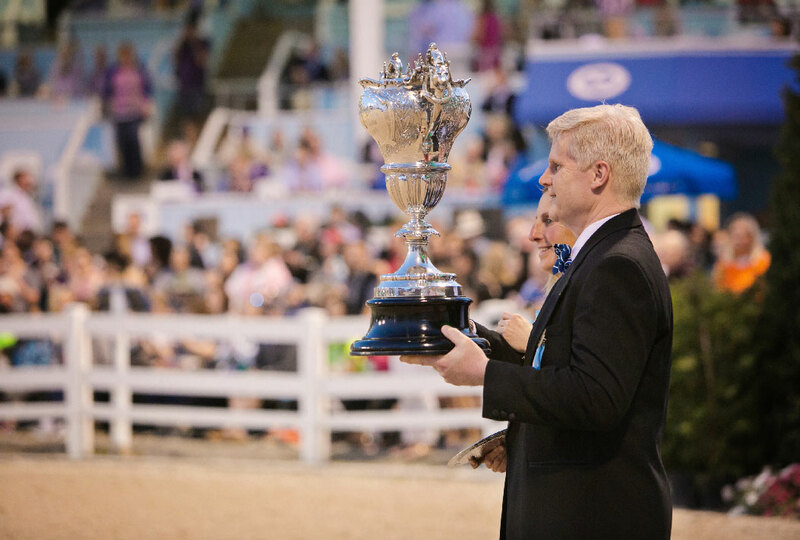 Presenters will be escorted by a member of the Trophy Committee into the show ring. It is important to provide the name and a cell phone number of your presenter at least 2 days before your scheduled class so that we may add their name to the list of presenters for our Trophy Committee’s reference. Due to safety concerns – the number of individuals representing the Sponsor is limited to two (2) individuals, preferably not children under the age of 12. Deadline for submitting the announcement: May 21, 2018. Deadline: All banners must be in the Horse Show Office by May 21, 2018. Sponsors with Reserved Parking will be permitted to park in a designated V.I.P. Parking Lot. Additional parking is available across from the Main Gate and on nearby neighboring lots. Be sure to identify yourself as a Sponsor and show your Sponsor Badge at the door when entering the Committee Stand Trophy Suite. Since seating is limited, your cooperation is much appreciated. Additionally, due to limited seating, we ask that you limit your guests to one person while in the Trophy Suite. Dogs are not permitted in the Trophy Suite or Committee Stand. No food is permitted in the suite. Sponsor badges are to be worn at all times. Thursday evening seats are ONLY available to Sponsors who have classes during these evening sessions. Proper attire is required for the Committee Stand Trophy Suite. Ladies: Skirts, dresses and dress slacks with dress shoes. Sandals are not recommended for award presentations. Gentlemen: Jackets and dress shoes. Tie required for award presentations. Tie suggested for others after 7 p.m. No denim of any color. No shorts at any time. The Hospitality Room is open Sunday, May 27th through Saturday, June 2nd from 5:00 p.m. – 7:00 p.m. Sponsor badges are required at the door and remember, no one under the age of 21 will be permitted unless accompanied by an adult. General Admission tickets are valid for a one-time entrance to the show grounds. Some sponsors may have reserved seating as a part of their sponsorship package. You may purchase additional “Reserved Seating” tickets by calling 610-688-2554. Food booths are open during all performances. Cafeteria style meals are prepared fresh daily for lunch and dinner. The new Devon Club offers exceptional entertainment space for 25-150 guests. Offering spectacular views of the Dixon Oval and Wheeler Ring, it is fully air conditioned and available for corporate events or private parties. Please contact evan@devonhorseshow.org for more information! Gates will open at approximately 8:00 a.m. and close at approximately 10:00 p.m. daily. The Country Fair area opens around 10:00 a.m. for the Midway and Shopping. The first Sunday, the gates will open at 11:00 a.m. and the Horse Show classes will start at 1:00 p.m. The Country Fair will hold a plant sale on the Sunday after the show and sell all the plants that have decorated the grounds for very reasonable prices. Morning / Afternoon Class Sessions end at approximately 5:00 p.m.
Evening Classes start at approximately 7:00 p.m.
All sponsors will be given a complimentary program book. You will receive program vouchers with your sponsor packets prior to the show. Become a Class Trophy Presenter for 2018! Class Winner: Donate $400, and present a special “Keeper Trophy” and receive an invitation to sit with three friends or family members in the Trophy Presenters Suite or Wheeler Ring Box before and during your class. Division Winner: Donate $600 and receive an invitation to present a trophy and sit with three of your friends or family members in the Trophy Presenters Suite or Wheeler Ring Box during your class. Please note that only service dogs are permitted in the Trophy Presenters Suite. Contact the Trophy Committee at 610-964-0550 for questions or additional information. Use the form below to inquire about becoming a Devon Horse Show & Country Fair sponsor.